The new Toronto Raptors alternate logo netted a mixed reaction from fans, but its redesign had nothing to do with Drake. The team's global ambassador reacted to criticism for the revamped emblem with a tweet directed at The Globe and Mail's sports columnist, Cathal Kelly. @cathalkelly Actually this redesign was executed without me. My collaboration with Mitchell & Ness comes out next season. Setting the record straight, the "Headlines" rapper insisted the new symbol was drafted without his input. The revision, which the CBC reports shares similarities with Drake's OVO brand, also bears a resemblance to the logo of rival NBA team, the Brooklyn Nets. In addition, save for a subtle clawing, it leaves the dinosaur branding of yore behind. However, this account differs from what Maple Leaf Sports and Entertainment senior director of communications Dave Haggith told the Toronto Sun on Friday. According to the executive, the 28-year-old songwriter had "great insights" about the new look, and was "one voice in the process." 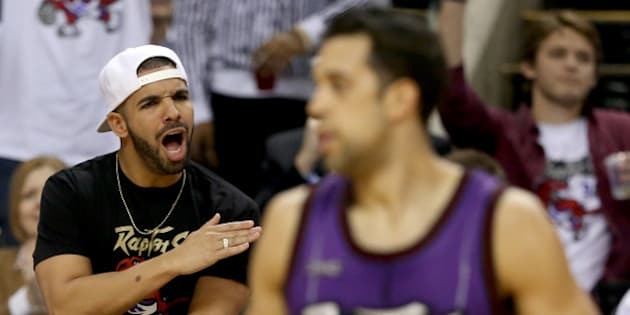 But one thing remains true, Drake's love of the team knows no bounds. Earlier this week, the Grammy winner hosted his second annual "Drake Night" at the Air Canada Centre, and spoke about his commitment to the Raptors. "I hate to be redundant, but I just care so much about the city and the people in it and night after night, it's amazing to see all these seats sold out."